Demonstration of how a liquid and solid can interact allowing for the liquid to "stack" on the solid surface without spilling over the edges. Students investigate the property dependence between liquid and solid interfaces and determine observable differences in how liquids react to different solid surfaces. They compare copper pennies and plastic "coins" as the two test surfaces. Using an eye dropper to deliver various fluids onto the surfaces, students determine the volume and mass of a liquid that can sit on the surface. They use rulers, scales, equations of volume and area, and other methods of approximation and observation, to make their own graphical interpretations of trends. They apply what they learned to design two super-surfaces (from provided surface treatment materials) that are capable of holding the most liquid by volume and by mass. Cost of materials is a parameter in their design decisions. In the field of heat transfer; mechanical, chemical and electrical engineers all work to increase the amount of heat that can be removed from surfaces. Maintaining a certain temperature on a surface is critical, especially in preventing circuit burnout in electronics such as computers, satellites and lasers. In many cases, engineers enhance heat transfer by coating surfaces with liquids. In those cases, the amount of liquid used and the nature of the liquid-solid interface are critical for successful designs. For example, too little contact between a liquid and solid can decrease, instead of increase, the heat removal. Engineers contribute their individual specializations to design challenges. If the goal is to improve heat transfer rates in electrical systems, a mechanical engineer may study the heat transfer through a heated surface using temperature measurements so as to be able to provide improvements to the design (construction). A chemical engineer may understand how materials properties affect the heat transfer through a heated surface and be able to provide improvements to the materials. And an electrical engineer may understand the effect that changing the heat transfer material has on the performance or efficiency of the electronics. Follow procedures to collect data while changing more than one variable. Represent measured data graphically and be able to explain in their own words what the graphical data means. Provide supported reasoning for final design recommendations using engineering concepts, such as surface tension is a changing property (soapy, salty, pure water), solid-liquid interface (smooth vs. rough). Math competency: Skills and appreciation for data collection and analysis used in real life. Quantitative literacy: Ability to follow procedures and provide recommendations. Engineering applications: Engineering design process, material selection and cost considerations. Cultural relevancy: Follow procedures, collaborative work in small groups and hands-on activities. Plan and conduct an investigation individually and collaboratively to produce data to serve as the basis for evidence, and in the design: decide on types, how much, and accuracy of data needed to produce reliable measurements and consider limitations on the precision of the data (e.g., number of trials, cost, risk, time), and refine the design accordingly. The structure and interactions of matter at the bulk scale are determined by electrical forces within and between atoms. Different patterns may be observed at each of the scales at which a system is studied and can provide evidence for causality in explanations of phenomena. The activity is designed to be completed during three 55-minute periods over three days. Some materials can be re-used across the three days, some materials are used on only one or two days, and other materials will be used up (such as test liquids). Table 1. The history of U.S. penny composition. Table 2. The surface tension of various liquids. Note: In this activity, "penny" refers to the copper penny, and "coin" refers to the coin-shaped plastic disk. Students are presented with the concepts of wetting and contact angle. They are also introduced to the distinction between hydrophobic and hydrophilic surfaces. Students observe how different surfaces are used to maintain visibility under different conditions. Students observe how water acts differently when placed on hydrophilic and hydrophobic surfaces. They determine which coatings are best to cause surfaces to shed water quickly or reduce the "fogging" caused by condensation. Students are introduced to superhydrophobic surfaces and the "lotus effect." Students learn how plants create and use superhydrophobic surfaces in nature and how engineers have created human-made products that mimic the properties of these natural surfaces. However, this activity could be used as a means of introducing many of these concepts. Whether we are discussing gases, liquids or solids, understanding how a surface interacts with contacting materials is critical in all engineering disciplines. Engineers must be concerned with selecting the best overall materials to use for the products, structures and systems they design. Additionally, they must be aware of how a solid may be affected through exposure to other materials. Water striders, A water strider can walk on the surface of water. Its hydrophobic legs are coated with wax. We are familiar with some interactions between solids and liquids in our daily lives because they are easy to observe. Some of them exhibit surface tension effects. Surface tension is a property of the surface of a liquid that allows it to resist an external force. This property is caused by the cohesion of like molecules, and is responsible for many of the behaviors we see in liquids. Surface tension has dimensions of force per unit length, or of energy per unit area. For example, surface tension is at work when you observe an object floating on the surface of water, even though the object is denser than water. Surface tension also enables some insects (such as water striders) to run on the water surface. A critical design aspect in the coatings used to make "waterproof" clothing is testing how well the fabric can force water to "bead-up" instead of soak into the fabric. Another example that we have all probably seen is when rain falls on a freshly washed and waxed car; we see the water bead up instead of spreading across the entire surface. This phenomenon speaks to the wetting ability of the surface. When a surface repels water (or causes the water to bead-up as opposed to spreading out) the surface is considered hydrophobic. If water can spread into a thin sheet across the surface it is considered hydrophilic. Now imagine yourself as an engineer—can you think of the possibilities and benefits to developing a material (or coating) that is self-cleaning? Self-cleaning surfaces are possible because of the effects of surface tension, but requires the perfect combination of surface and liquid. What might be some of the benefits of self-cleaning surfaces? Examples: Self-cleaning surfaces can improve the efficiency of solar panels by keeping them clean, since a layer of dust can reduce its efficiency by 15%. Self-cleaning surface coatings on the inside of pipes would prevent fouling (either wall build-up or wall corrosion) on the inside of the pipe, eliminating the need to replace old pipes. Click here to see an interaction between a liquid and solid surface that exhibits super hydrophobic behavior. The water beads up on the wood surface instead of spreading out over it. Click here to see what a hydrophilic coating looks like on glass. The left side of the glass slide was treated with a hydrophilic coating that caused the water to form a sheet of liquid, while the right side was untreated, resulting in the water beading up on the surface. By developing surface treatments that result in water forming a sheet, engineers create "self-cleaning" materials. This activity is flexible in the types/number of test liquids and the types of surface treatments that may be provided to students. As necessary, make modifications to the student worksheets by being aware of the following assumptions in the design of each. Materials listed in the Part 1 Worksheet are specifically for three liquids; change quantities depending on the number of liquids your class will test. Provide the opportunity for the class to agree on a standard test method for generating droplets (before they begin testing but after the worksheet has been handed out). Equations provided on the worksheet for calculating droplet diameter are based on the volume having units of ml and the droplet diameter having units of mm. Students need results from Part 1 to perform calculations in Part 2. -Have each group use their own numbers. -Have groups record on the board their values for each liquid (mdrop and density), then use this as an opportunity to perform statistical analysis on the data, as a class. This could be converted into a full class period activity in which students look at a scatter plot of all the data, determine the mean, median, mode, standard deviation, and conclude whether any erroneous data (outliers) exist that should be omitted. -Provide the class with values for each liquid (mdrop and density) based on the teacher's measurements or class measurements. Materials listed on the Part 2 Worksheet assume three liquids being tested. Figures 1-3 are all based on testing for three liquids. Analysis question 1 requires groups to look at the equations used in Part 1 (may need to provide some hints to help the class correctly approach this question. May need to change the materials list depending on offered choices of liquids and surface treatments. It is highly recommended that the chosen combination(s) of liquids and surface treatments be tested in advance of having students work with them. This helps to clarify when extra time that may be needed during testing. The solutions are not provided since any variations in the surface or surface treatment application, pipette, and/or liquid being used will generate different results. However, critical answers are supplied in the Background section (above). (optional) Run through Parts1-3 on your own. Collect liquids and/or create liquid mixtures. Make any necessary changes to the worksheets (see Background Section for considerations). Make copies of the Part 1 Worksheet, one per group of two students. Prepare a data table on the board for students to record their results. Label sets of 50-ml glass beakers with the names of the test liquids. Pour approximately 20 ml of each fluid into a 50-ml beaker. On the first day of this activity, students "investigate" and measure critical properties associated with the activity materials. Specifically, they determine the mass and size of liquid droplets formed with their pipettes, the density of their test liquids, and the mass and dimensions of the copper penny and plastic coin. It is important that students realize that while many of these properties could be looked-up (online, in reference books, etc. ), it is always "good practice" for engineers (and scientists) to perform their own measurements to verify that the values are "valid" for their specific materials in hand. Begin by providing students with an overview of the activity. Include a brief description of what they will be doing each day and how each part contributes to the ultimate engineering design aspect of the activity. For example, by acquiring a general idea of the liquid-surface interactions (in Part 2), they avoid making poor design decisions later (in Part 3). Without knowing accurate liquid and solid properties (from Part 1) the data collected in Part 2 will not have much meaning because the value of number of drops is not a transferable value (for example if different pipettes were used, or if the room temperature or humidity were different). Next, describe some engineering applications to give a general motivation behind why the behavior they will be observing (interactions on a surface) might be important in the real-world and to engineers. For example, in many cases fouling (or corrosion) on a surface impacts how devices and objects perform. A house pipe might become corroded on the inside and prevent or contaminate the flow of liquids. Dust collecting on a solar panel lowers the amount of electricity that can be generated because the dust limits how much solar energy reaches the electrical capacitors inside the panel. This is similar to how it becomes difficult to see through your car windows if they get really dirty. Another very different example is when liquids are used as a means to transfer heat. Due to conduction, the liquid film creates an extra "insulation," which alters the amount of heat being transferred. Next, have students arrange themselves into groups of two and provide each group with one copy of the Part 1 Worksheet. As a class, review what they will be doing in the lab. Introduce the procedures for each test, demonstrating the materials they will be using, as necessary. Then, lead the class in a discussion about the importance of test procedures (to enable a uniform test that results in similar results independent of the person performing the test). In this discussion, have the class agree on procedures for generating droplets (in Part 1, the speed is critical; in Part 2, the speed, height and location are all critical for uniform testing). Have teams write the speed on Page 1 of their worksheets. Depending on the number of liquids your class will be testing (and their proficiency at following the test procedures), Part 2 may need to extend into Day 3, especially if allowing more time to discuss results with the entire class (which is HIGHLY recommended). First, have students move into their groups and hand out copies of the Part 2 Worksheet and Student Testing Sheet. Discuss with the class (again) how each group should approach generating reproducible droplets. Have groups describe these procedures on the Part 2 Worksheet (page 1). Then have groups record the critical values from the previous day onto their Part 2 Worksheet (page 1). Go through the student-designed test procedures for Part 2 and emphasize that students should only test the heads-side of the copper penny. If you are dividing the class (half testing heads and half testing tails), make these assignments now. Discuss with the class why this would be important (again, reproducibility of results and the two sides are clearly different). When no more questions or clarifications are forthcoming, direct teams to begin testing the fluids. Have the same groups form as on the previous days. Today you will add a "twist" to what you did in Part 2. Now groups will have the opportunity to make changes to properties of the surface (surface treatments). Hand out the Part 3 Worksheets (one per group). Then begin a class discussion of the Part 3 goal, which is for students to be imaginative and recognize possible trends in performance based on how the liquids interact with the surface. As desired, extend Part 3 to provide the class with more time to do investigations into how liquids and solids interact. Be sure to discuss the general engineering design process if it was not discussed during Day 1. Each group's design challenge is to MAXIMIZE the volume of liquid a surface can hold while also MINIMIZING the cost of materials. They now also have the control of which liquid to use, which surface to use, and what surface treatments (if any) to use. Explain that everything they use has a cost associated with it (this is the way it works for engineers too!). Groups can test multiple designs (caution them on how much time is available though). Students also now have freedom as they collect data. Depending on the level of the class, provide them with examples of "good" data to record. Have students use the Part 3 Worksheet tables to record critical values measured in Parts 1 and 2. Be sure that all groups are using the same values (this ensures that test results from each design are comparable). At the end of testing, with at least 20 minutes left at the end of the period, have students record on the board the statistics on their best design solution (surface, liquid, modification, # drops, volume and cost). Lead a class discussion of to share and compare final test results. Did any groups test the same design with different results? Which designs had the same cost but different results? Which designs had the same results but different costs? What can we conclude? Which best met the requirements of the design challenge? Which is the optimum design? area: The two-dimensional size, or total exposed surface, of an object. Example units are square cm and acres. compatibility: A measure of how stable a material is when mixed or in contact with another material. If two materials do not change when in contact, then they are considered compatible. durability: Refers to the lifetime of a material or product. A material that has a long usable life is considered durable. hydrophilic: Hydrophilic molecules tend to be charged or polar molecules, enabling them to more easily dissolve in water. hydrophobic: Hydrophobic molecules tend to be non-polar and thus repel themselves from polar molecules including water. 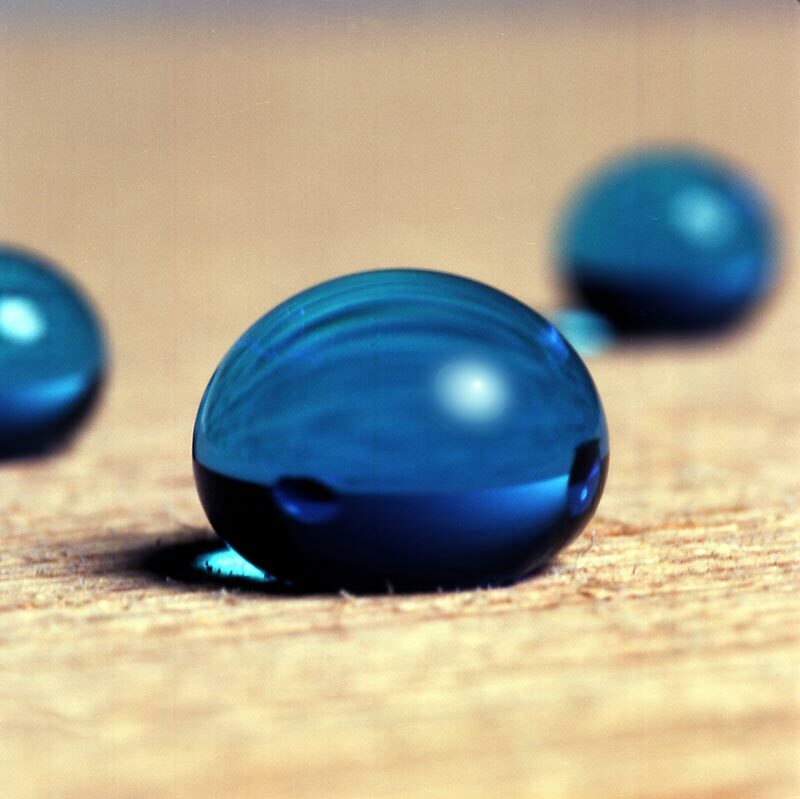 Water on a hydrophobic surface tends to bead up on the surface, exhibiting a high contact angle. Hydrophobic materials are commonly used for oil removal from water because the hydrophobic material attracts the oils and not the water, thus separating the two. physical property: Any aspect of an object or substance that can be measured or perceived without changing its identity. Physical properties can be intensive or extensive. An intensive property does not depend on the size or amount of matter in the object, while an extensive property does. volume: The space that an object or material occupies in three-dimensional space. Example units are milliliters (ml) and cubic cm. Worksheets: Have students use the three worksheets to guide each portion of the activity. Review their data and answers to gauge their comprehension of the material. Optimum Design Discussion: As a class, compare Part 3 design results for looking for the optimum designs. Which team's design best met the design challenge? Reflection: At activity end, ask students to reflect back on the three-part activity, writing no more than a page that expresses how they would describe the activity to a younger student, what they learned that they didn't know before, what their group partner was best at contributing to their teamwork, their favorite step of the engineering design process, and what changes to the activity would make it better. People should never ingest liquids and chemicals in a lab setting, even if they think they know what they are. Have students investigate whether the ridge on the penny plays a role. This requires purchasing flat copper disks that are identical in size to copper pennies for testing. Have the class determine whether the head or tail side of penny holds more. If you have a large enough class, have one-half of the class test the heads-side and the other half test the tails-side and compare the results at the end of Part 2. Have the class investigate the variance in using different drop generation methods. This content was developed by the Culturally Relevant Engineering Application in Mathematics (CREAM) Program in the Engineering Education Research Center, College of Engineering and Architecture at Washington State University under National Science Foundation GK-12 grant no. DGE 0538652. However, these contents do not necessarily represent the policies of the NSF, and you should not assume endorsement by the federal government.